The tradition of playing polo had been lost in oblivion in Russia for over a century but it's now being revived, with help from the sport's historic powerhouse, Argentina. Horses count among the most trusted friends of mankind. This is why polo is one of the most ancient popular sports. The game was first played in Persia more than 2,000 years ago, and has only slightly changed since then. It still takes the same skills to score goals with a long-handled mallet, on a field that's twice as big as a football pitch. 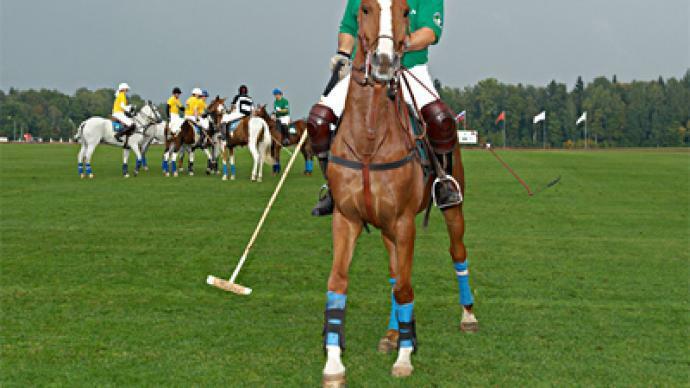 “The most important thing in polo is probably the so-called chemistry between the man and the horse. They should be sympathetic to each other. Also it's crucial to learn to ride in childhood, although even adult persons, who come to the sport late can reach pretty good results in terms of training hard every day,” says Hernan Traverso, Moscow Polo Club coach. Back at the turn of the 20th century polo was quite a popular sport in Russia, but after the revolution the tradition was broken. It was only brought back to life a few years ago, and the Moscow Polo Club, which was established in 2006 by Aleksey Rodzyanko, is now one of the major centers for the sport. It also hosted the Russian Open Championship, which was being held for the sixth time. “You need a lot of players, you need a lot of horses, and you need a lot of competition as in any sport. You need to practice, practice, invest, invest and invest. So far we've been doing what we can, but it's all private and it's all based on the enthusiasm of the players themselves and their money,” Aleksey Rodzyanko says. “In terms of price, horses are like cars. It's not only about how expensive it is. It's very important to choose the one that would suit you. In this respect, you should always take an expert's advice. As for the price, it may be from $8-10 thousand, say in Argentina, and up to $500,000 at some auctions,” Hernan Traverso explains. Human resources are always a crucial factor. In this respect polo in Russia has a competitive advantage as the Traverso brothers are two grand masters from the sport's powerhouse, Argentina. This time around glamorous Russian fans of this elite sport have a unique opportunity to get up close with Hernan for a short masterclass on the secrets of polo, and witness the Russian Open finals where the tournament's top player Alejandro led his team, Beluga, to victory. However, there's still a lot to do to make Russian polo competitive on the international arena. “It is low now, because it is a new sport here. We need a lot of work, a lot of evolution. People have to know what polo is. Because most of them just don't know what it is. But I think it's improving with all that publicity, and it makes it possible that soon more people will play polo in Russia,” says Alejandro Traverso. Polo has never been only about winning and losing, with another member of the winning team, Russia's top polo practitioner Mikhail Rodzyanko, being the best proof of this. “The better you treat your horses the better they perform. I don't care if i lose or win. I just enjoy it. It is a team sport and, first of all, a team here means the horse and the rider. And that's the best thing about it,” he says.